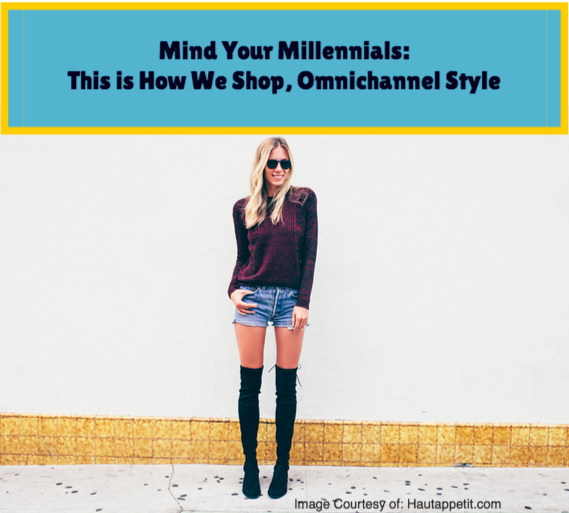 There are endless consumer shopping statistics that explain the shopping experience millennials undertake to make purchases, but there are very few narratives from real shoppers to illustrate the process. Fall down the retail rabbit hole and join me on my shopping journey to learn what tactics help (and hurt) your brand's conversion. Nearly everything I buy starts with Instagram. Scrolling through pictures posted by friends, brands, retailers, and fashion bloggers is the cause of a lot of product coveting and ultimately, purchasing. I recently saw one of my favorite fashion bloggers wearing the most beautiful over the knee suede boots. I search for brand information on her blog and bingo: Stuart Weitzman Lowland Suede Boots. They're undeniably gorgeous and at $795, well outside my price range. Despite being unable to afford that particular pair, I know, without a doubt, that I need boots that hit well over the knee for Winter 2015. First I check to see what my favorite retailers have in stock whenever I have a little extra time, which is usually during my commute. 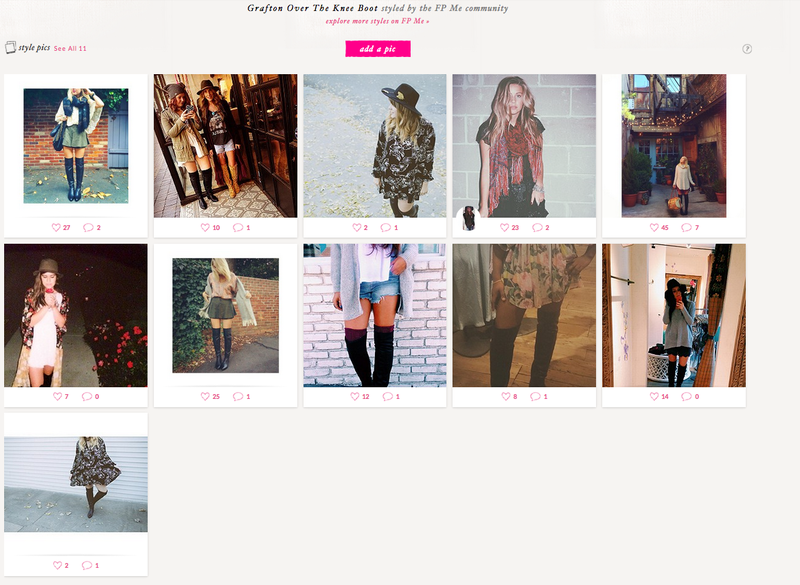 I search "over the knee boots" to see what catches my eye. My favorite online shops are aligned with my personal taste, yes, but they are also the websites that include lots of diverse product images, consumer reviews, and extensive product details. 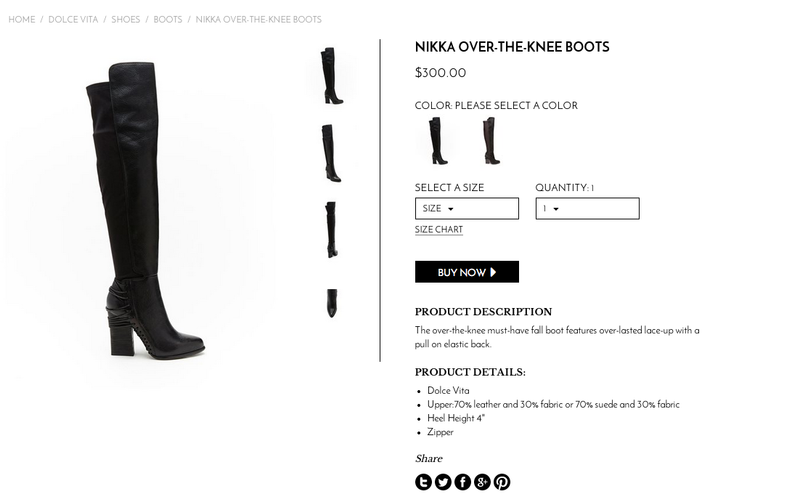 For example, I notice and appreciate the retailers that have specific product categories that consistently follow relevant trends, which in this case would be an "Over the Knee" or "Tall Boots" category. I do additional searching on Instagram using hashtags #overthekneeboots and #otkboots to see if I can find any lesser known brands to pursue. I've purchased many of my favorite items, often from new and unknown brands, thanks to one or two great Instagram pictures. Like many of my peers, my end game is to find items that no one else has that I feel offer a great value for the price, and preferably that price is one I can afford. I found a lot of over the knee boots I liked during the research phase, but most of them were eliminated for various reasons. I vetoed the boots that were priced out of my range as well as the boots that seemed priced suspiciously low; I truly believe in the old adage "you get what you pay for" especially when it involves shoes. A low price point, to me, indicates low quality. The material used to make the boots is another important factor: any pair of boots that doesn't include information on the material is out of the running. Consistently poor reviews are a red flag that warns me to stay away. One or several poor reviews aren't a game changer, especially if the review is based on subjective opinions like shape, sizing, or heel height, but ifeverysingleperson who has bought something is unhappy with their purchase, it's most likely a product issue, not a consumer issue. Product images are crucial to my purchase decisions. I categorically refuse to buy apparel and accessories online if there aren't multiple pictures of the item being worn by a human. Flat shots are necessary, but lifestyle shots are ultimately the key to my final purchase decision. Ultimately I spent about a month researching my options during my spare time, often on my cell phone during my bus ride commute to and from work. During my search I perused the assortment of every major department store as well as around 50 other retailer's online platforms, which varied from national chains like Urban Outfitters to well known independent boutiques with respected online platforms like Need Supply Company. I also made it a point to check British retailers Topshop and ASOS because they often have options that aren't available at US retailers. After a thorough search, I was left with three contenders. 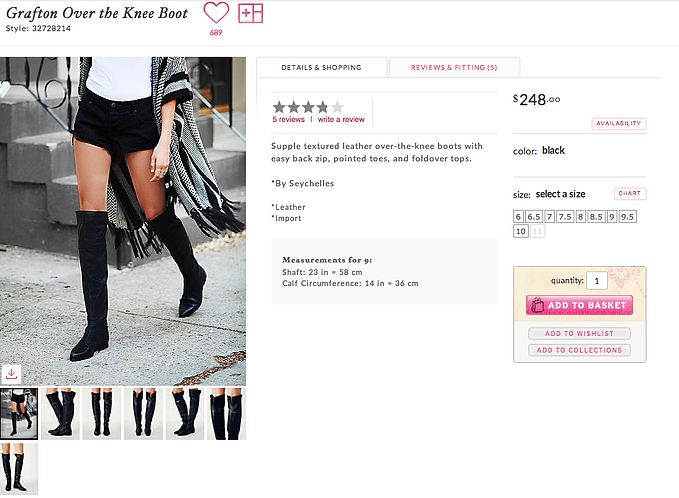 The first: Free People's "Grafton" over the knee boot by Seychelles. 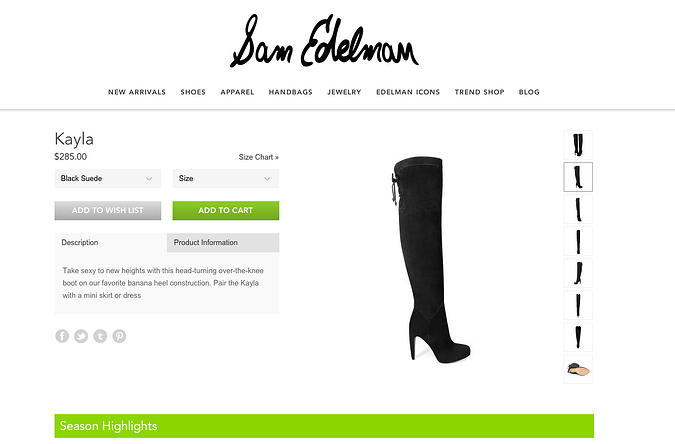 The second pair is by Sam Edelman, the “Kayla” Suede Over the Knee Boot. The final option is Dolce Vita's “Nikka” chunky over the knee boot. I never jump into an online purchase lightly. I hate shipping back online returns, so I try to be as thorough as possible when I'm considering an online purchase. For each of the pairs of boots above (and every other purchase I've done online) I did a Google search to see if I could find product reviews and pictures of the boots being worn, either on retailers' websites or on style blogs. The Seychelles “Grafton” style had 5 reviews that were mostly positive, but what really set this style apart was Free People's "Style Pics" section which allows members of the Free People Community to upload pictures of themselves wearing Free People products. It's a genius strategy: without any added effort, Free People has added a wealth of product images, all created by their customers, instantly creating a sense of peer approval. The “Kayla” style by Sam Edelman are everywhere. They're by far the most popular style among style bloggers and on Instagram, and carried by nearly every major retailer including Shop Bop, Nordstrom, Amazon, Urban Outfitters, and the brands own eponymous site. The reviews were nearly unanimously positive and there were many lifestyle images to peruse, mostly due to the popularity of the boots with style bloggers. More than one website listed these Sam Edelman beauties in a “steal” vs “splurge” round up comparing them with the very same Stuart Weitzman styles I myself had admired. While normally I adore finding styles popular with style bloggers, in this case they were almost too popular, and for a shopper who prides herself on having unique style based upon hard to find items, it was kind of a turnoff. The Dolce Vita “Nikka” Style is also available from an array of retailers and all of the consumer reviews that I could find were very positive. There are enough lifestyle shots that I felt like I had a good sense of what the boots would look like on the body, they have a chic pointed toe with a stacked heel (for comfort), they're made of real leather, and I own and love several pairs of Dolce Vita ankle boots. When I buy shoes I want them to be cute but I also want them to be comfortable, versatile, and sturdy because I commute via public transportation which requires a lot of walking and exposure to the elements. With that in mind, I decided to try and try on each pair of boots in store. I try to buy things in a brick and mortar store as much as possible because I like the instant gratification of taking home my purchases, rather than waiting for them to be shipped. I love to shop but I rarely have a whole day free so I often try to find products at stores that are within walking distance of my office so that I can stop there during my lunch break or before I head home for the day. I tried to find stores that carried these three boot styles. Despite living in Boston, a major metropolitan area, not a single pair was accessible to me. Free People doesn't carry many styles of shoes in store and Seychelles doesn't offer a list of retailers on their website. There wasn't a single department store in my area that reported either the Sam Edelman "Kayla" or the Dolce Vita "Nikka" as in stock. Without the benefit of trying on the shoes in store, I decided to order the "Nikka" style from Dolce Vita for a few reasons: I've been happy with shoes from that brand in the past, and the block heel looked comfortable enough to wear during the day, yet offered enough height to wear out at night. I may have preferred one of the other pairs if I had a chance to try them on in-store but, unfortunately that wasn't an option. All of the shops are selling the Nikka Boot for $300, give or take a few dollars, with one exception: Amazon. The mega-retailer lists these boots at $271.76 with an additional 25% off making the final price $203.44, nearly $100 less than any other website. I use my mom's Amazon Prime account, so shipping is a non-issue. Normally this type of discount would be more than enough to pull the trigger and give my business to Amazon, but because Black Friday and Cyber Monday are descending upon us, I decided to wait it out and see whether or not I can get an even better deal online during the holiday weekend. It's Not Over Till You Click "Buy"
Despite more or less deciding to purchase the Dolce Vita boots, after a month of searching for the perfect pair the habit of scrolling through Instagram for potential options was a hard habit to break. I continued to search while waiting to see what deals Black Friday and Cyber Monday would bring. 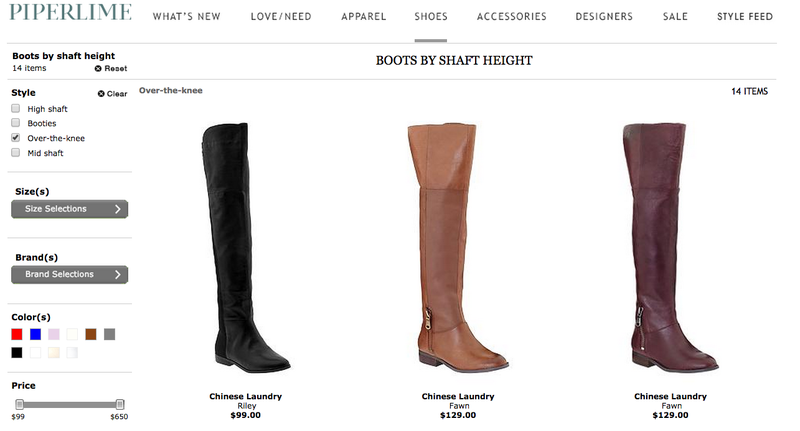 I decided to try searching thigh high boots to see if there were any new options that didn't pop up for over the knee. I noticed a pair of boots by Spanish shoe brand Miista called "Emi" was posted multiple times on Instagram by many different shoppers, and each picture was accompanied by glowing praise. I realized that I had seen this style earlier in my search on the Urban Outfitters website, but I'd eliminated it as an option, both because they didn't come in my size and I didn't love how the faux leather looked in Urban's product images. Searching on Instagram I learned that the "Emi" style also came in faux suede and looked like a funkier version of the Stuart Weitzman beauties that had fueled my original shopping adventure. Despite my previous reserves about purchasing boots that are imitation suede, I felt that familiar feeling bubbling up: these were the boots for me. Further research only offered more reasons to purchase: the product reviews on multiple websites were unanimously positive, and the boots were made in Spain as opposed to China or India. A Google search informed me that the boots are available in black suede from San Francisco retailer Ashbury Skies. When I clicked over to their website I was delighted to find that they had started their Black Friday sale early: all black styles were 20% off. I was also impressed by their helping sizing suggestion that the boots run slightly small and shoppers should buy the boots in one-half size bigger than usual. Despite not being able to try the boots on, I felt confident in my purchase thanks to the glowing feedback from my peers, the high volume of lifestyle pictures, and the sizing suggestions. The Black Friday discount was all the encouragement I needed to click buy, but I was delighted to see that Ashbury Skies also offered a free shipping option, which is something I will remember. I can spout off a list of retailers who offer free shipping for every category of product by memory; I will do whatever it takes to avoid shipping fees. The retailer also had a simple checkout process that only required me to fill out my name and address as well as a PayPal payment option, which I love as it negates the need to pull out my debit card and limits the amount of companies that have access to my payment information. I'd found the perfect boots at a great price from a lovely independent retailer, and I felt nothing but excitement and satisfaction as I confirmed my purchase. Throughout this omnichannel shopping journey, product information was key. It's very important to provide enough information about what material the shoes are made of, what the shaft length of the boot is, what the heel height is, what the brand is, and where the boots are made. While the country of origin wasn't a factor that fueled my search, I felt good about buying boots that were made in Spain because, to me, that indicates higher quality. 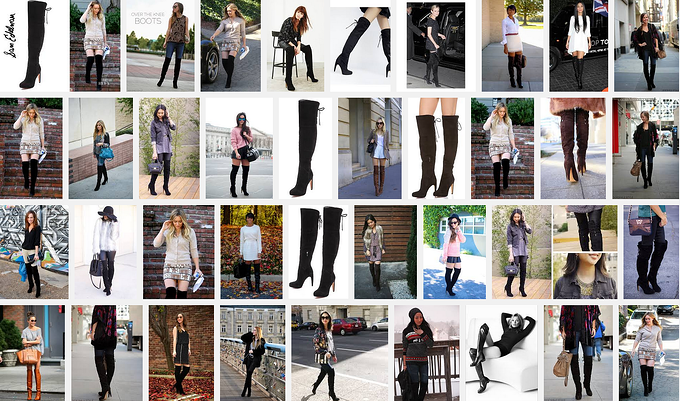 Remember when I searched "over the knee boots" on different retailers websites? There may have been additional over the knee styles that didn't populate my search because they didn't include the necessary extended attributes. There is currently no standardized requirements for product attributes, although GS1 US is working to change that, as we highlighted here. Other important attributes in this particular shopping experience would include what materials the boots are made of and what the measurements are: heel height, shaft length, calf width, etc. Product Information doesn't just come from the retailer: social sharing and product reviews are a crucial part of the buying process: despite my original preference for real leather or suede, seeing so many great pictures and positive reviews both on Instagram and various retail sites was ultimately more important than the material for my final purchase decision. Product images are also a key part of the product information: If the images don't give consumers a feel for what a product looks like in real life, they don't feel comfortable committing to the purchase. Brands don't necessarily need to create these images themselves, but instead facilitate an easy way for satisfied customers to share their content, whether that means images or product reviews. Finally, it's important to facilitate an easy purchase process for consumers: an early Black Friday discount coupled with free shipping and a one-step checkout was ultimately impossible for me to resist.